Welcome to Sensitive Engineering, Manufacturer and Exporter of Roll Forming and Cutting Blade Machines. The company was established in 2013 at Rajkot. International quality standards and Ethical business practices make us unique in the industry. Client centric approach, Market leading prices and Flexible payment modes make us the first choice of our clients. We offer a vast range of Decoiler and Double Track Roll Forming Machines. Our Forming and Crimping Machines are best in the industry amongst others. 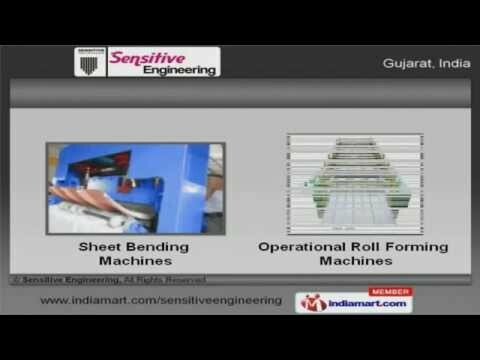 We offer Sheet Bending and Operational Roll Forming Machines that are widely acclaimed in the market. Industrial Crimping and Industrial Roll Forming Machines offered by us are acknowledged for their functionality. Along with that we offer Double Layer Roll Forming and Sheet Corrugation Machines that are a class apart. We also provide Costom and Purlin Roll Forming Machines that are extremely reliable.